Backstreet Bustle, level World 5-3, is the third level of World 5 in Super Mario 3D World. The level is unlocked by clearing Sunshine Seaside, but it is first blocked by a Bowser statue that requires 80 Green Stars to remove. Completing this level unlocks Chargin' Chuck Blockade Is Back. It is one of the shortest levels in the game. Some of the localized titles for this level illustrate its point more clearly. This level is a very small underground room, and players are given only 100 seconds to reach the Goal Pole on the other side. The level is filled with Multi-Vators and Double Cherries; meant to help players get through the level, collect the Green Stars, and grab the top of the Goal Pole. There are also paths that allow players to bypass the Multi-Vators entirely and head straight for the goal, but these are guarded by Fire Piranha Plants. Green Star 1: Ground Pounding a small portion of broken tile to the immediate left of the starting point causes the first Green Star to pop out. Green Star 2: Three Doubles or players need to activate a three-person Multi-Vator, which carries players across to a platform. This is illustrated in the picture above. Green Star 3: This is to the left of the Multi-Vator mentioned above, and is also shown in the picture. Four Doubles or players need to activate a four-person Multi-Vator, which carries them up to a platform. Alternatively, players can use the Cat Suit to scale the wall. A switch that only Toad can activate reveals the stamp. 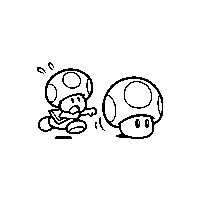 The stamp is Toad chasing a Mushroom. This page was last edited on March 10, 2019, at 03:04.